Join us in congratulating the Monnin family for being this month’s Logan County Chamber’s Business and Entrepreneur of the month. With over 600 Ashley stores worldwide the locally owned Ashley Furniture HomeStore has set themselves apart from the rest with their business philosophy of “Be the Difference”. Helping their customer make the best buying decision for their home and lifestyle and having a major impact in their community guides the staff and owners David and Ben Monnin every day. The local Ashley store at 2400 US 68 South was recently awarded the company’s “ 4 Star Excellence Award” for sales growth and in January of 2016 was nationally recognized among over 500 retail stores as the second runner up for the “Chairman’s Award”. This was presented for outstand-ing business performance, being a preferred employer and partner in the community with elite community service programs. 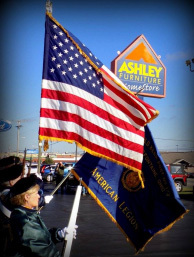 Ashley Furniture’s largest community service project is their ongoing effort for local veterans. 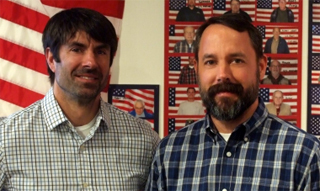 Veterans are honored in the store every day and then annually with a celebration around Veterans Day. 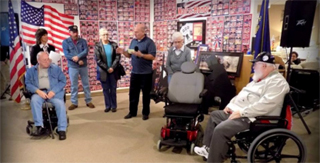 The November 7, 2015 Veteran Cele-bration was their largest event to date with more than 200 people in the store honoring approximately 120 Veterans. During this event $7,000 in free furniture and two motor-ized scooters were given to veterans in need. Additional donations and support that day were given to multiple Veteran organizations and helped support the local veterans in the “Vets to DC” trip in May of this year. These contributions including the Marion and Mansfield Ashley stores’ totaled over $50,000 last year. 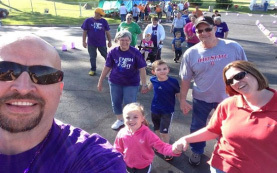 The 100th “A Hope To Dream” bed was given away to children in need in our local community along with the “Team Ashley” Relay for Life that Bellefontaine Ashley employees have been involved with for 17 years, $3,549 was raised this past year. They sponsor and donate time and equipment to Doors of Encourage-ment, women’s and homeless shelters and send military care packages. Ashley is involved with Rotary International, the Chamber of Commerce, Red Cross, the United Way, Discovery Riders, 4-H and the local county fair. Dave and Sandy Monnin founded Highland Home Furnishings in Bellefontaine in 1989. In 2008 with their parents’ retirement, David and Ben took over all store operations and began converting to Ashley Furniture HomeStores. Currently the three locations: Bellefontaine, Marion and Mansfield employ nearly 70 employees. Ashley HomeStore is a full-line furniture and mattress store with home accents and accessories. They also offer free in-home de-sign consultations. There is a new look and feel at all three store locations with further plans underway for ex-tensive updates inside and out. Including a name change and logo update, from Ashley Furniture HomeStore to Ash-ley HomeStore. All of the Ashley employees feel it is important to be as involved in every aspect of the community. They choose to be a part of the Logan County Area Chamber of Commerce so that they can stay abreast of what is going on in their community and have a voice. 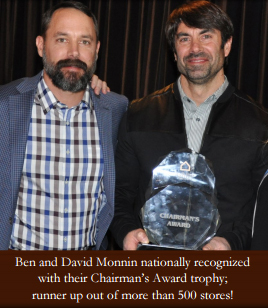 Logan County Chamber of Commerce would like to recognize David Monnin and Ben Monnin for their dedication and commitment to this community and to the Chamber. We congratulate Ashley Furniture HomeStore and their entire staff on being selected March’s Business and Entrepreneurs of the Month!